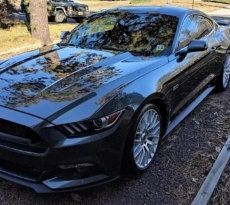 This Mustang of the Moment goes to Mustang6G member Cerv14 (Chris) and his 2015 Mustang GT. 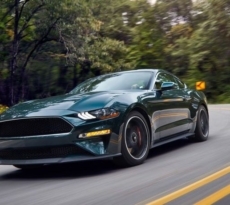 After having his 2015 Mustang EcoBoost totaled in a four-car accident back in February, Chris, who luckily works for our friends at CJ Pony Parts, decided on a Competition Orange Performance Package Mustang GT this time around and in a very short time has turned it into a real head-turner. The exterior of the vehicle is headlined by gloss black body line accent side stripes, a tattered American flag hood decal and a gloss black roof vinyl wrap which contrasts nicely with the Competition Orange paint. 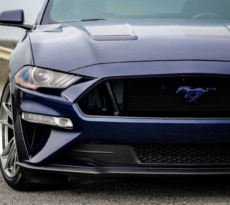 This Mustang GT also has a Steeda front splitter with 6-inch black aluminum support rods, Ford black-painted GT350 track pack rear spoiler and gloss black rear decklid pony emblem. Exhaust and suspension have been upgraded with a Ford Performance by Borla Sport cat back exhaust with chrome tips, CJ Pony Parts lowering springs, Whiteline front camber adjusting bolt kit, and Steeda Autosports front and rear sway bars. 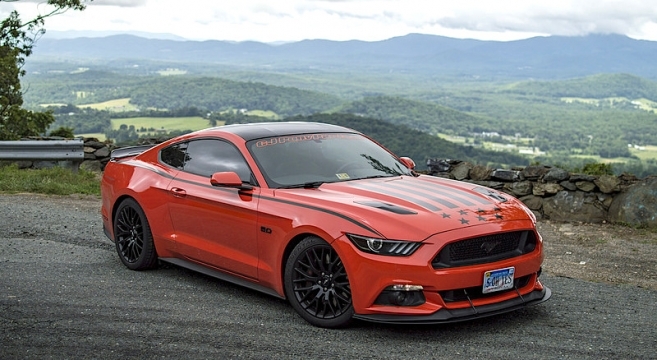 For the full list of modifications and Chris’s 2015 Mustang GT build journal, check out our forums.